Pima County has contracted to buy $22 million worth of solar-produced electricity over a period of 20 years from Solon Development, a company which received a no-bid contract from the County. Solon will built 11 solar arrays over parking lots. Pima County will pay a fixed price of 12.8 cents per kilowatt over the life of the contract, versus 12.1 cents per kilowatt the County now pays to Tucson Electric Power (TEP). 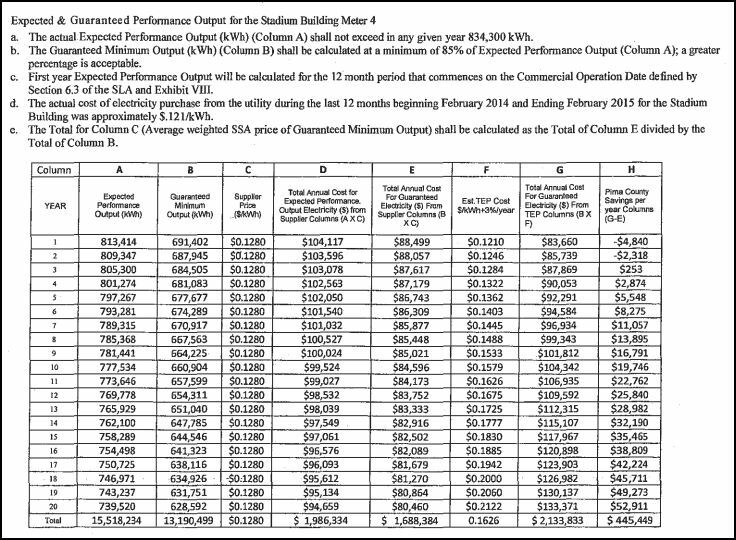 Doing a little math shows that while the TEP price remains at 12.1 cents, the County (taxpayers) will be spending about $60,000 more per year for electricity under this deal. Pima County, however, claims there will be a savings of $4.5 million over the life of the contract. 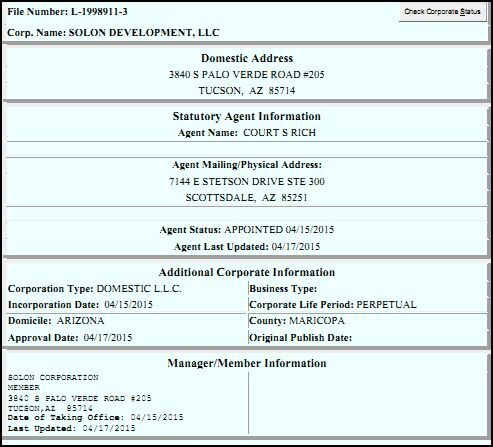 While “Solon Development, LLC” may technically be local, it is actually a subsidiary of Solon Corporation, a German company. According to Solon Corporation website, their legal address is SOLON Energy GmbH, Am Studio 16, 12489 Berlin, Germany. So, our very own local company is not so local. Was Pima County in negotiations with the parent company before creation of Solon Development? In the chart above, does the expected performance (column A) take into account that PV solar panels typically produce only about 20% of its rated capacity? Will County taxpayers really save money? Posted in Energy, Politics and tagged Pima County, PV, Solar energy, Solon on May 15, 2015 by wryheat2. How do we know that Pima County officials are working on what they are supposed to? And how much time do they spend on certain projects? The Southern Arizona Business Coalition (SABC), an advocate for Rosemont, wanted to know how much time Pima County officials spent on Rosemont copper mine related business over the last two years. One of SABC’s interests was to find out if Pima County officials were using taxpayer money to aid groups that are opposed to the mine, as Pima County is. This excuse suggests that the County should change its operating procedures so that they are more accountable and transparent. Businesses require accountability from their employees. Even I, as a largely free-ranging geologist, had to account for time spent so the company could properly attribute time and expenses to specific budget items. Why doesn’t Pima County require this employee accountability? SABC estimates that 38 County employees spent at least 10 percent of their time over the last two years on the Rosemont issue. That time cost taxpayers over $400,000 per year. And SABC estimates approximately 3% of staff time was spent over the previous 3+ years. Of course, at least some of that time would be legitimate processing of required permits, but how do we know how much. As I mentioned above, how much time and taxpayer money was spent on, shall we say, extracurricular activity that could aid opponents of the mine? Pima County will not or cannot say. Since the County did not provide adequate time allocation for the staff and legal office, SABC made assumptions based on previous information and experience in this issue and estimated that the County spent approximately $1 million on staff time (including Supervisors and their staff), outside consultants and legal fees fighting Rosemont. 2) The County Attorneys Office claimed attorney-client privilege regarding billing records. This is a spurious argument since the attorneys are either County attorneys or attorneys hired by the County and the County is also the client. The right hand can’t disclose what the left hand is doing? This is another transparency issue. The County Attorney could have provided time allocation without violating attorney client privilege, but chose not to. This is “the dog ate my homework” excuse. Pima County broke the law if it did not maintain official records. Arizona law requires the County to “carefully protect and preserve the records from deterioration, mutilation, loss or destruction and, when advisable, shall cause them to be properly repaired and renovated.” A.R.S. § 41-151.15; and A.R.S. § 39-121. These excuses show lack of accountability, lack of transparency, and failure to follow the law on record keeping. Since Pima County has stated publicly it is against the Rosemont mine, one wonders how much time was deliberate delay and obfuscation in permit processing. SABC alleges that Pima County also wasted time and money by attempting to duplicate work done by 17 federal agencies. Taxpayers deserve better County accountability no matter which side of the Rosemont issue we take. Is Pima County Park Plan Legal? Can the County legally take this bond money and put it to another use? If a similar precedent rules, then the answer is no. From my reading of the Star’s story on Catalina State Park bonds, Pima County is contemplating what amounts to the same thing as the Cave Creek case, which means Pima County may be embarking on an illegal activity. Such action could cost taxpayers money to defend any lawsuits that may arise. That’s my take on this proposal, but I’m not a lawyer. What do you think? Pima County officials seem to be doing everything they can to delay and deny Rosemont Copper from opening a mine south of Tucson. As Hugh Holub wrote, this “delay as a form of denial..scheme involves gumming up the decision-making process with demands for additional studies, appeals to governmental entities, lawsuits and whatever other tactic that can put off a final decision.” And the delay is costing taxpayers in the form of fewer jobs, lost economic opportunity, and lost tax revenue. According to Rosemont, the mine will produce over 400 direct jobs and about 1,600 indirect jobs that will provide about $3 billion in increased personal income over the next 20 years. The mine will provide local governments with tax revenues of about $19 million per year and create $700 million in local economic stimulus in such things as services, real estate, retail purchases, utilities and manufacturing. One step in mine approval is that of obtaining an air-quality permit from Pima County. According to the Arizona Daily Star, “under federal laws, the county should have made its permit decision in December 2010 – 30 days after the county declared the company’s permit application complete.” The county has yet to issue a permit and is searching for any lame excuse to not do so. The result of that delay is that Rosemont is suing the County for specific action. Taxpayers must bear the cost of defending the suit due to County perfidiousness to those it is supposed to serve. All of this is especially ironic because the County declined its chance to buy the property before Rosemont Copper became involved. 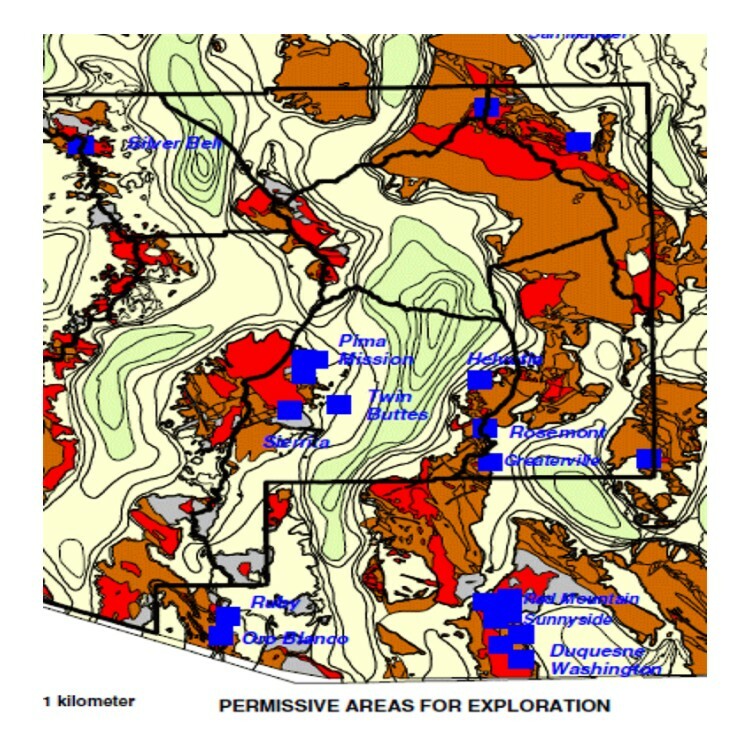 Pima County is well-endowed with mineral resources (see: “Mineral Potential of Eastern Pima County, Arizona“). The anti-mining stance of Pima County officials does not bode well for our economic future. The green zealotry of these officials is not serving the people. And, a mine is a terrible thing to waste. Pima County’s Sonoran Desert Conservation Plan (SDCP) has been touted as one of the best and most comprehensive habitat conservation plans in the country. Planning began in 1998 in response to the 1997 listing of the Cactus Ferruginous pygmy owl as an endangered species. The owl was removed from the endangered species list in 2006 because the listing was found to be based on flawed science. The legal idea behind SDCP was to obtain dispensation from the U.S. Fish & Wildlife Service (FWS) in the form of an Incidental Take Permit under section 10 of the Endangered Species Act. The idea was to allow county public works to proceed even if they would incidentally harm some endangered species. To do that the County had to specify which species it was going to protect and how it would do so. According to FWS, both federally listed and unlisted species can be covered in the incidental take permit acquired through a Habitat Conservation Plan (HCP) if issuance criteria are met. The three principal criteria are: 1) that impacts are mitigated to the maximum extend practicable; 2) sufficient funding (taxpayer dollars to pay for land acquisition and monitoring for the life of the permit) is assured up front; and 3) the issuance of the permit won’t jeopardize the species. Note that all species named in the HCP will be treated by FWS as if they were listed as endangered. The County’s purchase of local ranches is part of its mitigation scheme to satisfy FWS. In reality, the plan gives the County tighter control over use of private land. The County’s plan has had a long gestation period, much longer than normal for habitat conservation plans in general. Finally, early this year the County submitted its plan to FWS who expect to put it out for public comment by the end of this month. I was involved in the early stages of SDCP. For 5 years, beginning in 1998, I was a member of a Citizen Steering Committee that was formed to address concerns of various stakeholders (and satisfy a FWS requirement for public input). During that time, I attended many meetings and collected 35 CDs full of reports and other information. You can read most of the reports at the County’s dedicated website: http://www.pima.gov/cmo/sdcp/. In my opinion, SDCP is based on flawed science. I am not alone in that opinion. The Town of Marana and City of Tucson both refused to become parties to SDCP because of their concern with the scientific justifications. Besides the Citizen Steering Committee, the County recruited biologists, both private and university professors, to form a Science and Technical Advisory Team (STAT). In March 2001 STAT produced its major report entitled “Priority Vulnerable Species: Analysis & Review of Species Proposed for Coverage by the Multiple-Species Conservation Plan.” I will refer to that report as PVS. At a public meeting on March 22, 2001, Dr. William Shaw, head of the county’s Science and Technical Advisory Team said of the team’s data, “biological knowledge is woefully inadequate,” a sentiment echoed by each speaker, and by a peer review committee which evaluated STAT’s work. The multispecies conservation plan and Permit will affect use of private land because it mandates that: 1) Within “Important Riparian Areas” 95% of the land shall be conserved in undisturbed natural condition; 2) Within the “Biological Core” at least 80% of the land shall be conserved in undisturbed natural condition; 3) Within “Multiple-use areas” at least 66% of the land shall be conserved in undisturbed natural condition; 4) Within “Special Species Management Areas” at least 80% of the land shall be conserved as undisturbed natural open space; 5) Within “Critical Landscape Connections” barriers to the movement of flora and fauna should be removed. In addition to the above classifications, SDCP proposes to have “Recovery Areas,” “Recovery Contribution Areas,” and “Supplementary Population Management Areas.” For lands within the Conservation Lands System, the county will require “rigorous site analysis” prior to development. SDCP also proposes to restore riparian areas by planting hundreds of trees which the county estimates will use up to 2.6 billion gallons of water annually. In subsequent iterations of the plan, these restriction percentages may have changed or become obfuscated, but they have been largely incorporated into the County Comprehensive plan. The land classification system was put together based on opinion and computer modeling. Here is how they did it. The STAT team didn’t do any actual field work or checking of ground truth, they instead resorted to data mining. One problem with data mining, i.e., using large data sets from other studies, is that the data are rarely, if ever, verified for accuracy. Another problem is that data mining lends itself to selective extraction of data that might not be representative of the original study. Habitat distributions for many of the vulnerable species are poorly known and published accounts of known populations are few; therefore, habitat modeling based on environmental characteristics was conducted in order to provide the most complete, scientifically based depiction of species habitat. Recognizing the critical knowledge of many Pima County biologists, these ‘expert reviewers’ were asked to be part of the modeling process. Reviewers identified key environmental variables describing habitat and helped Geographic Information Systems (GIS) analysts score environmental characteristics for each species. Analysts then built GIS models based on these environmental parameters resulting in maps of high, medium, and low potential habitat. Biologists were then asked to review habitat maps and revise model parameters if necessary. This iterative process of GIS analysis and biological review resulted in refined models that more closely represented vulnerable species habitat. County biologists based their map overlays, their GIS data layers, on the opinions of 13 biologists and upon a fourth data set, the federal government’s GAP program which uses satellite imagery to, among other things, map vegetation cover. The assumption is that vegetation type can be accurately associated with species requirements and therefore species habitat. The GAP program ran into problems when it attempted to validate the model by gathering factual field data such as finding the critters and then mapping land characteristics where the critters actually occur. In other words, the limited real data collected do not support the model very well. There often was a big difference between modeled potential habitat and actual habitat. The PVS report was the result of the biologists’ best guesses, “woefully inadequate” real data, and computer manipulations. And the results showed it. The report had many conflicting statements and some very strange recommendations. So, county scientists, after applying “the best available science,” recommended preservation of 13,300,000 acres in Pima County for this one species. Trouble is, the total area of the County is 5.9 million acres. There is another problem with this recommendation. According to the report, “estimates of populations in maternity roosts range from 200 to 130,000 (USFWS 1995).” If we multiply just one large roost worth of bats, say 130,000, by the 5,320 acres which county scientists claim each bat needs for a home range, we get a total home range requirement of 692 million acres, or nearly 10 times the total area of Arizona. These errors derive, of course, from rote calculation of the subjective habitat scoring system in a computer model which has, apparently, not been checked for ground truth, or even common sense. I did point out these errors to county officials. As far as I can tell, the county did not significantly modify the land classification system. However, I noticed that in subsequent reports, they did not publish numbers anymore, only general, ambiguous statements. The habitat conservation plan and Section 10 Incidental Take Permit will apply only to unincorporated County land. It cannot be legally applied to land within incorporated areas, nor to federal land, nor State Trust land, nor to Indian Reservations. That leaves a highly fragmented area which in reality cannot form an integrated habitat. 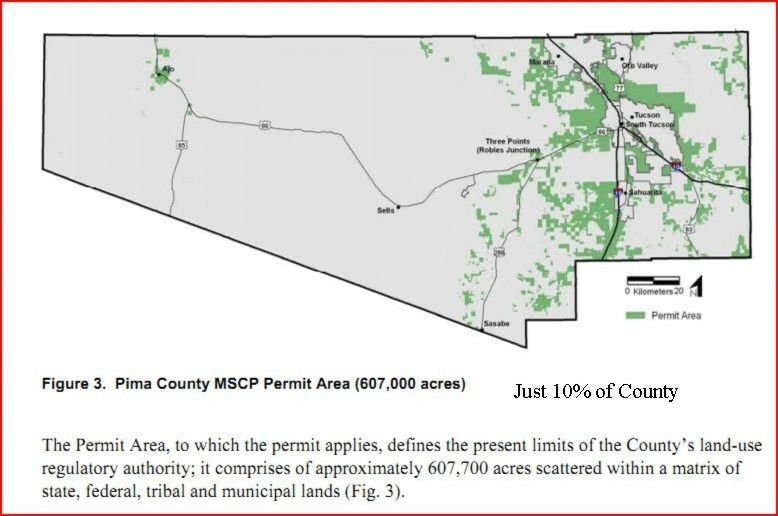 Pima County has gone through the motions to obtain a permit, but the flawed scientific basis and reality of land fragmentation make the Sonoran Desert Conservation plan an empty showpiece, one that is costing, and will cost, taxpayers money and restrict use of private land. I will recommend to FWS that they reject the application for permit. UPDATE: The map below shows the “permit area” in green, the land to which SDCP applies. Notice how fragmented it is. The fragmentation makes a conservation plan very difficult to effect actual benefits. And since this is such a small part of the County, will it make much difference to species? 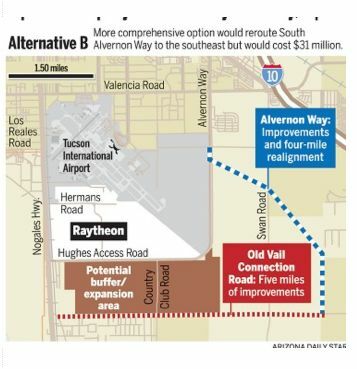 In an earlier post, I asked Pima County why it favored rerouting Alvernon Way around the Tucson Airport (see map) at a cost of $31 million rather than gain access from the Nogales Highway to land for potential expansion of Raytheon, a major Arizona employer and defense contractor. Route continuity or having continuous major thoroughfares that are connected regionally or in metropolitan areas is an important aspect of mobility. Alvernon north of Interstate 10 connects to the central city and to the Golf Links/Alvernon major transportation corridor along the northwest side of Davis-Monthan Air Force Base. It is important to link Alvernon to both the interstate and its north/south component for improved regional access. In addition, the selected route of Alvernon transitioning into a road running southeast and paralleling Tucson International Airport allows the new road, including Old Vail, to become a major perimeter access road for the airport. 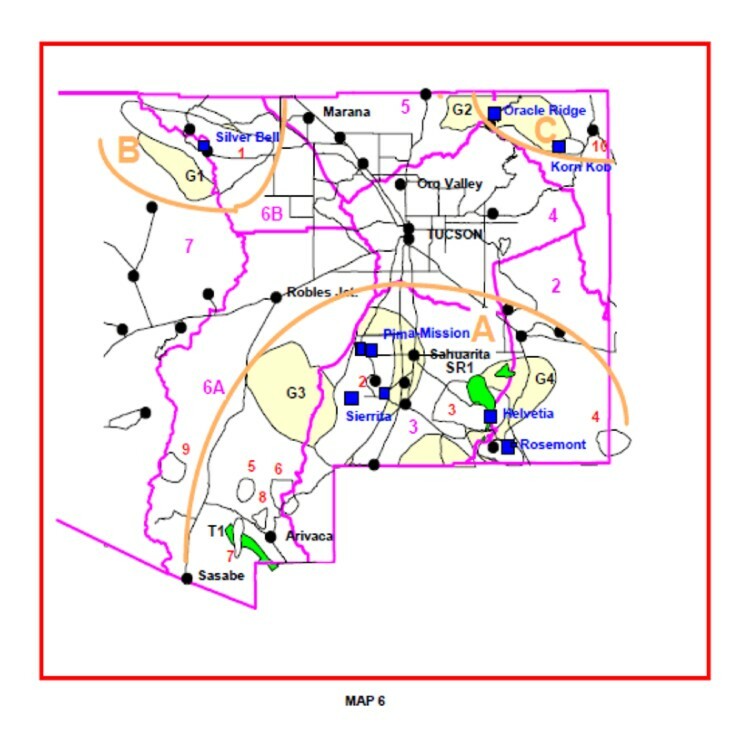 Most major metropolitan communities have high-speed transportation access along the perimeter of their international airports; our access to Tucson International is predominantly north/south and needs to be improved such that access to the airport can be gained from the south to the north as well as from the east to the west. Discontinuing continuous routes leads to a great deal of confusion and right and left turn movements that greatly reduce transportation efficiency. I thank Mr. Huckelberry for responding promptly. See the original post and additional comments here. An Op-Ed by Pima County Administrator Chuck Huckelberry in the Arizona Daily Star last Sunday urges the Arizona Corporation Commission (ACC) to “allow Pima County and other large organizations to build solar-energy plants that would, in effect, supply much of their own electricity.” Mr. Huckelberry estimated that such a program would save the County $60 million over 20 years. The County will install solar farms totaling 50 MW on County-owned land by contracting with one or more private solar development companies through an arrangement called a “Solar Service Agreement” (also called a “Power Purchase Agreement”). Under a Solar Service Agreement, the private solar developer pays for the construction, operation and maintenance of the solar farm. The County pays only for the actual amount of solar energy produced by the farm. The County pays no upfront capital costs, and no bond elections are necessary. The $60 million savings is based on the cost savings we projected for our existing 1 MW solar photovoltaic array at the Roger Road Wastewater Reclamation Facility. The private developer of that facility expects it to produce more than 2 million kilowatt hours (kWh) of energy annually, and more than 40 million kWh of energy over the next 20 years. We have locked into a fixed rate of $0.0959 per kWh for the entire 20-year contract term. By contrast, our current TEP municipal service rate is $0.1029. We estimate that rate could increase by roughly 2.4% a year, based on the annual increase in consumer energy prices projected by the U.S. Energy Information Administration’s Annual Energy Outlook 2010 with Projections to 2035 report. That particular projection is the “reference” projection, which assumes no changes in current laws. We acknowledge that energy rate forecasts vary and actual energy prices are subject to a variety of influences, so that is why our estimate is an approximation. The difference between the fixed rate per kWh we will pay for the next 20 years at the Roger Road Solar Facility, and the amount of money we otherwise would pay for conventional electricity over the next 20 years, is roughly $1.2 million given the factors and assumptions above. We multiplied that savings for 1 MW by 50 MW, which is the total County energy load, to yield an approximate savings of $60 million over 20 years for a 50 MW installation. Please note that while solar energy prices continue to come down, we did not factor this into our projection. If the County gains permission for this plan and builds the solar arrays, it could then feed the electricity into TEP’s grid and be credited for that amount. The County expects ACC to discuss the proposal today. The City of Tucson and Pima County are collaborating on a region water plan. It’s about time. But you should read the reports: government concepts of priorities might not be the same as those held by property owners and businesses. recommendations in the Phase 2 Report. The City wants your comments. Principle 1: Water is an essential part of life for humans and the environment. Delivery of water and wastewater must maximize both quantity and quality. Principle 2: The environment must be considered a user, not simply a provider, of water resources. Principle 3: Policies affecting water and wastewater must be open to wide public discussion in a completely transparent process. Principle 4: Water is an economically-valued resource and must be managed with due consideration to its economic value. Your comments are needed to help the City go from concepts to practice. For some additional background, please read my posts: Water Supply and Demand in Tucson, and How Much Water is There. Posted in water and tagged Action Plan, Arizona water supply, demand management, Pima County, smart growth, sustainability, sustainable development, Tucson, Tucson water, water on September 17, 2010 by wryheat2. A front page story in today’s Arizona Daily Star reports that the Oracle Ridge copper mine on Mt. Lemmon, near Summerhaven, might be reopened. The story contains some errors. The Star’s error lies in confusing tons of rock mined with tons of copper metal contained in the rock. The Oracle Ridge mine was producing 1,000 tons per day of rock which contained just over 2% copper, as well as some value in gold and silver. There is more confusion in the Star’s story: “News clippings from the time the Oracle Ridge mine was operating showed a much lower production rate, [than the 1,000tons] however. Tom Olsen, the mine’s general manager in the 1990s, told the Star in 1992 that it produced about 50 tons daily, or enough to fill two truckloads with copper concentrate.” Here the Star is confusing tons of copper concentrate with tons of rock. Copper concentrate is produced from a flotation process that separates most of the copper minerals from the enclosing rock. Copper concentrate is smelter feed and typically contains 30% copper (at least at the large porphyry copper plants). The 50 tons of concentrate, reported as shipped, would contain about 15 tons of copper metal. The Oracle Ridge mine was discovered in 1900 and has had spotty production since 1937. The last production was from 1991 to 1996. In 1994, Mintec, a consulting firm specializing in ore estimation, was contracted to complete a reserve estimate as part of a feasibility study for increasing the mine and processing plants capacity to 2,000 tons per day. The Mintec model estimated 8.14 million tons of proven and probable ore at a grade of 2.33% copper containing 379,000,000 lbs of copper and an additional possible or inferred resource of 16.57 million tons at 2.33% copper containing an additional 772,000,000 lbs of copper. No allowance was made for dilution, mine loss or pillars left in place, and gold and silver grades were not estimated. The data base for these estimates included 534 drill holes totaling 163,622 feet. I visited the mine during that time to evaluate it for the major mining company I worked for (or for strict grammarians, the company for which I worked). The mine was considered too small to be of interest to a major mining company, but it could make a good small mine for a junior company. The Oracle Ridge mine is on patented mining claims, i.e., private property. The Star’s story also said that “County Supervisor Ray Carroll, a vocal opponent of the Rosemont proposal, said he will lead the opposition to reopening of the Oracle Ridge Mine. Republican Carroll’s district includes that site and the Rosemont site.” It seems that Mr. Carroll doesn’t want any much-needed jobs or economic development to despoil the grandeur of nature in his district, property rights notwithstanding. UPDATE: Following publication of this story, the Star reporter called me. The original story in the Star has been changed reflecting my comments. The reporter is trying to verify the original data in the press release by the company interested in buying the property. And, a correction of my own: some sources say the mine was worked as early as 1881. Southern Arizona is blessed with abundant mineral resources, and cursed with a Congressional delegation and county supervisors, such as Ray Carroll, who would deny us that blessing. Representatives Gabrielle Giffords and Raul Grijalva have introduced HR2944, the Southern Arizona Public Lands Protection Act of 2009 into the House. This bill would prohibit staking of mining claims, mineral leases, and geothermal projects on all federal land in Pima and Santa Cruz Counties (subject to pre-existing rights). This is essentially a response to the Rosemont mining venture. Apparently, these politicians are not in favor of good jobs or economic opportunity. The law is also poorly written and may have unintended consequences. For instance, the law would prohibit “all forms of entry, appropriation, and disposal under the public land laws.” The word “entry,” in what I think is the intended context, means “mineral entry” the terminology used for staking and registering a mining claim. But, as written, the law could be construed to prohibit cattle grazing, hunting, hiking, other forms of recreation, and use by the border patrol. The only “entry” we will see is by illegal aliens and drug smugglers. To give you some idea of the mineral potential of Pima County and the folly of HR2944, I present below, excerpts from a 2001 publication, “Mineral Potential of Eastern Pima County, Arizona” published by the Arizona Geological Survey as Contributed Report 01-B. This report was written in response to Pima County’s Sonoran Desert Conservation Plan by The Southwestern Minerals Exploration Association, a group of local geologists (I am a co-author of the report). Mineral production has always been viewed as an essential industry, not only to generate wealth and provide employment, but also for the array of products that are consumed by a society. Terms such as Bronze Age and Iron Age have served to demonstrate the essential role of minerals in improving a society’s standard of living. Today, in what we have come to call the Technology Age, the demand for minerals and mineral-bearing products has grown exponentially. This is not surprising, over the last four thousand years, societies with mineral technologies have flourished, while those lacking mineral resources have either conquered to take others, or have ultimately perished. Mineral production is essential to our civilization because minerals provide the raw materials which allow our society to function. Pima County is endowed with many mineral resources, not only copper mines, but also the important products such as sand, gravel, and limestone used everyday in supporting the infrastructure of our cities. It is essential that these mineral resources, and the lands where they occur, remain available for exploration and development. Pima County has a unique, and complex, geological history which makes it critical habitat for large copper deposits, geothermal resources, and many industrial minerals such as sand, gravel, gypsum, and limestone. This report documents known occurrences of these mineral deposits, and delineates areas with the greatest potential for future discovery of additional mineral deposits, based on existing geological and geochemical data, and upon proven methods of investigation. The first map below shows the distribution of known copper deposits in Pima and Santa Cruz Counties. The red color show outcrops of Laramide intrusives, which can be the generators of the mineral deposits. The brown shows outcrops of older host rocks. Additional potential occurs in the valleys under cover. The next map shows (in blue) the geothermal potential in Pima County. This is a low temperature resource suitable for space heating and cooling for industrial parks and residential developments such as apartments, town houses, condominiums and neighborhoods composed of single-family dwellings. This type of resource is also suitable for aquaculture and greenhouse agriculture. Studies show that 30 degree C water is ubiquitous at depths of 300m and that potential exists for potential for 50- to 55 degree C water at a depth of 1,000 m.
The red area is a mercury anomaly which sits below our water recharge project in Avra Valley (does Tucson Water know about this?). Not to worry though, the mercury anomaly is 75-750 ppb Hg while ADEQ allowable residential standard is 6,700 ppb Hg. (Reference: Hahman, W. R. and Allen, T. J., 1981, Subsurface stratigraphy and geothermal resource potential of the Avra Vally, Pima County Arizona: Arizona Bureau Geol & Min. Technology, OFR 81-5). The American mining industry pioneered Arizona. For more than one hundred years, metal and aggregate companies have operated under the rules and regulations set out in legal frameworks. Few anticipated that they would lose access to land for future mineral development. Viewed as a societal good, access to the land encouraged growth. The mineral products provided much needed materials for construction, trade, and local economies. Land-use planning was motivated by economic development needs, manifest in the desire for improved tax bases and infrastructure. Therefore mining plays a key role. We should not let short-sighted politicians deprive us of these benefits.